Windows Phone 8 flagship handset takes on Samsung GALAXY S III and iPhone 5. After months of speculations, Nokia's second wave of Lumia phones has finally hit the Indian market. While, an official announcement from Nokia is still an hour away, online retailer Saholic.com has already listed the Lumia 920. The website has priced it at Rs 36,500 and is offering free home delivery in 3 business days. Just to be sure, we spoke with the store officials to confirm availability and pricing details. As many already know, Lumia 920 is based on Microsoft's latest Windows Phone 8. The phone is powered by Qualcomm's Snapdragon S4 chipset, featuring a dual-core 1.5 GHz CPU and Adreno 225 GPU. It has an 8.7 mp PureView camera with dual-LED flash, Carl Zeiss optics, and Optical Image Stabilisation. Apart from that, you get a 4.5" IPS panel with pixel dimensions of 768x1280, 1 GB of RAM, and 32 GB internal storage. 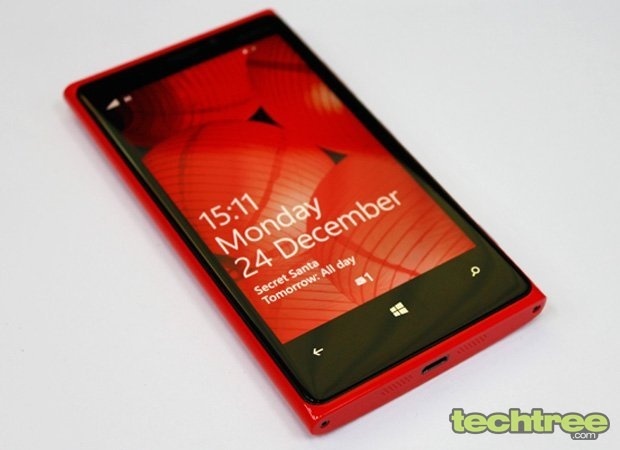 Before you place an order though, don't forget to check out our Lumia 920 review. If you've found the camera and its specs impressive check out this article shedding light on its nifty camera tricks as well.